The wild-haired, frequently sockless Albert Einstein may be the icon of 20th century physics, but there's perhaps no personality in physics more celebrated than Richard P. Feynman. Famously a bongo-player, safe-cracker, and straight-talker, Feynman worked on the Manhattan Project and shared a Nobel prize for discovering quantum electrodynamics, the quantum laws of electromagnetism. Near the end of his life, Feynman was part of the commission chosen by President Reagan to investigate the 1986 explosion of the shuttle Challenger. During a televised public hearing, he used a C-clamp and plastic cup of ice water to demonstrate that the shuttle's rubber O-rings lost their flexibility at low temperatures. That was Feynman’s style: no-nonsense, unpretentious, engaging, and powerful. Feynman was a celebrated lecturer; these days you'd be hard-pressed to find a physicist's bookshelf without the three requisite cardinal-red volumes of the Feynman Lectures on Physics, transcribed from his days teaching a two-year introductory physics course at Caltech. 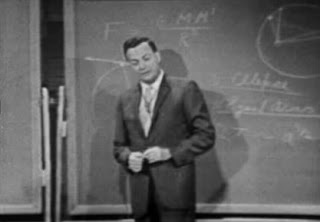 Audio of his lectures has also been available for a long time as well; there's something wonderful about hearing the interactions of forces and particles elucidated in the strong dialect of Feynman's native Far Rockaway, Long Island. …I'm interested not so much in the human mind as in the marvel of nature, who can obey such an elegant and simple law as this law of gravitation. So our main concentration will not be on how clever are to have found it all out, but on how clever she is to pay attention to it! The lectures are an unprecedented opportunity to learn physics from one of the most entertaining, brilliant teachers of the last hundred years. (I guess I'll forgive Gates for requiring viewers to download something called Silverlight, which does not like Google Chrome.) If even that requirement offends your tastes, or you're looking for something more advanced once you've visually devoured these seven hours of lectures, try out his lectures on quantum electrodynamics. Feynman also had a life-long obsession with a little-known kingdom in the depths of the Soviet Union, a place he first discovered via the "wonderful triangular and diamond-shaped stamps" that wended their way from that tiny country to his childhood stamp collections. The Microsoft project gets its name from the same place – Tanna Tuva. Sadly, Feynman passed away before fulfilling his dream of reaching Tuva, but his daughter, Michelle Feynman, finally made the pilgrimage this year. You can listen to a radio documentary of her journey produced by the BBC World Service.